Princess Cut, Baguette, and Round Diamond Engagement Ring | Shane Co. 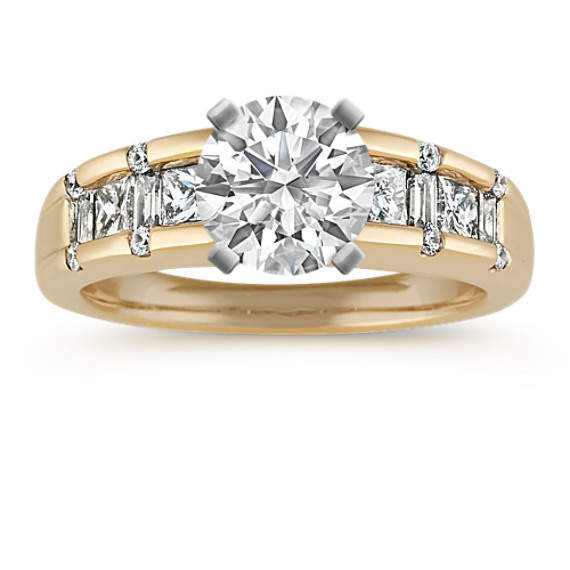 This sleek and modern 14 karat yellow gold design spotlights four princess cut diamonds at approximately .53 carat TW. These magnificent stones are flanked by four baguette diamonds, at approximately .15 carat TW. As a final touch, eight round diamonds, at approximately .07 carat TW, add sparkle and style to the edges of this design. The total diamond weight is approximately .75 carat. Add the center diamond of your choice. Gemstone Carat Weight :.15 ct. t.w.